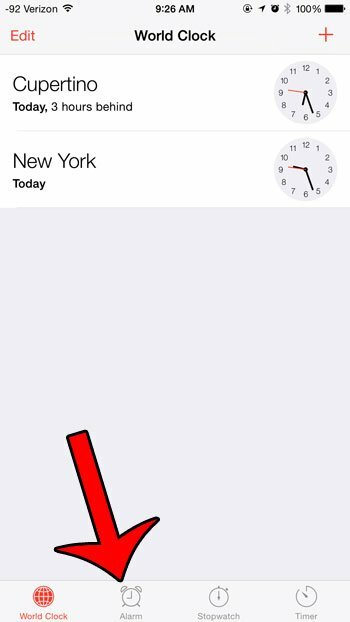 Using your iPhone as an alarm clock feels like a practical thing to do. You probably have your phone with you regardless of where you are going to sleep, so whether you fall asleep in bed, on the couch, at a friend or family member’s house, or in a hotel, you can take advantage of your iPhone to ensure that you wake up when you need to. 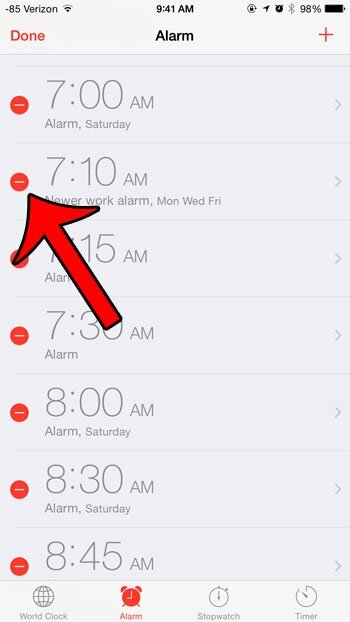 But working with the alarm clock on the iPhone can be a little tricky if you are unfamiliar with it, so our tutorial will cover everything that you need to know about creating, editing and deleting alarms from your iPhone. 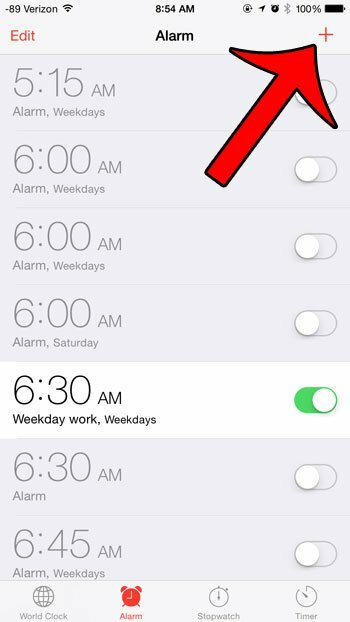 Click any of these links to be taken to the task that you want to learn how to perform with your iPhone alarms. 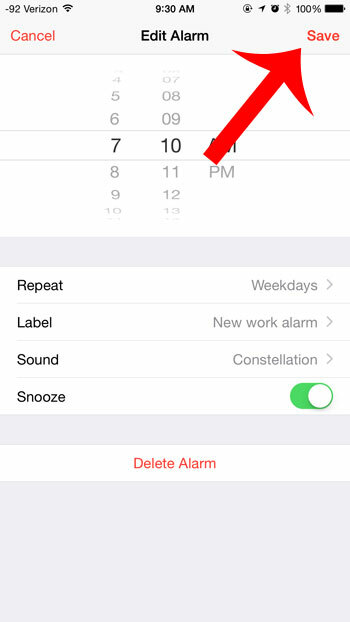 Step 1: Open the Clock app, then select the Alarm option at the bottom of the screen. Step 2: Tap the + icon at the top-right corner of the screen. 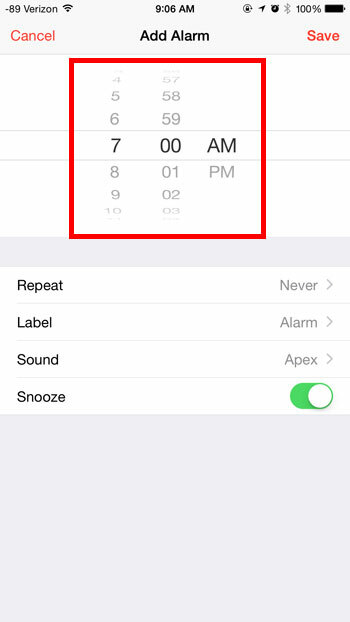 Step 3: Move the wheels at the top of the screen to set the time for the alarm. 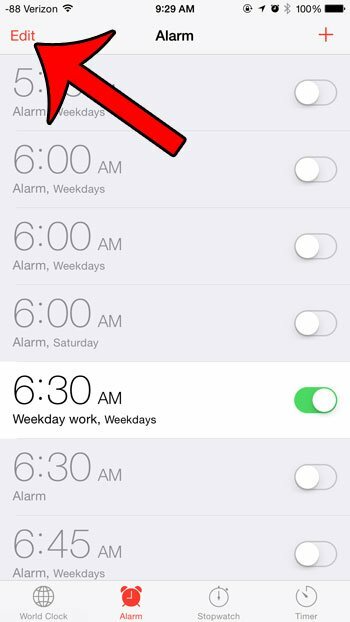 Step 4: Tap the Repeat button to select the days the alarm goes off, then touch each day to include it. The alarm will go off on days with a check mark. 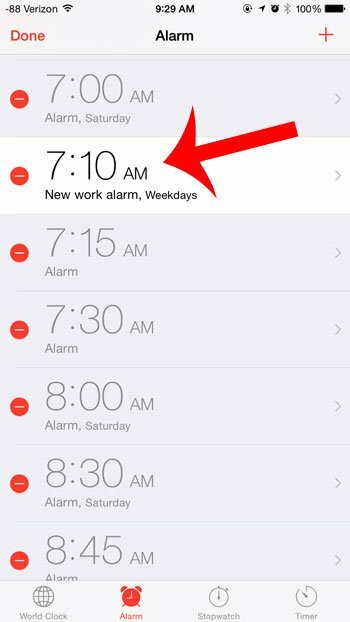 Tap the Back button to return to the alarm menu. 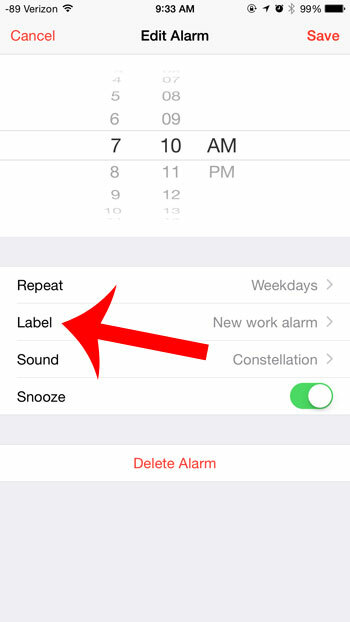 Step 5: Tap the Label button, then type a name for the alarm. Tap the Back button when you are done to return to the menu. 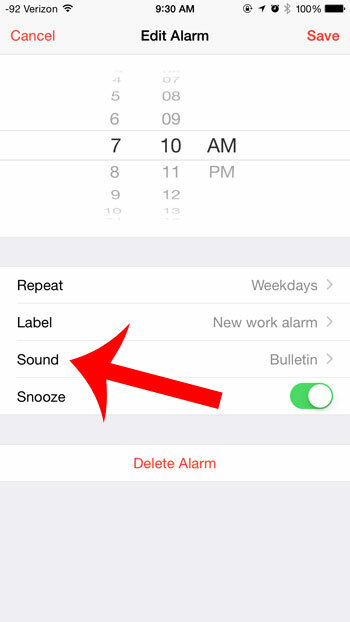 Step 6: Tap the Sound button, then select the sound that will play when your alarm goes off. Tap the Back button to return to the menu. Step 7: Select whether you want this alarm to have a snooze option. 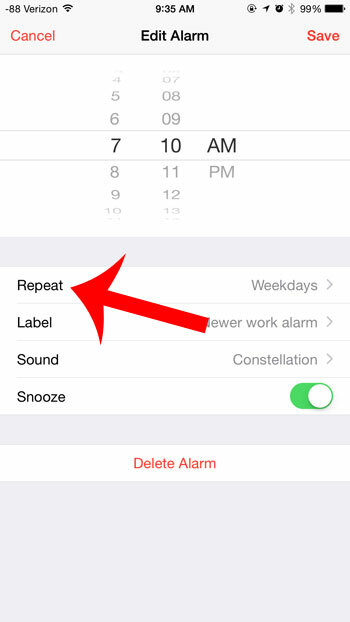 If there is green shading around the Snooze button, then there will be a snooze option. If not, then you will not have a snooze option. 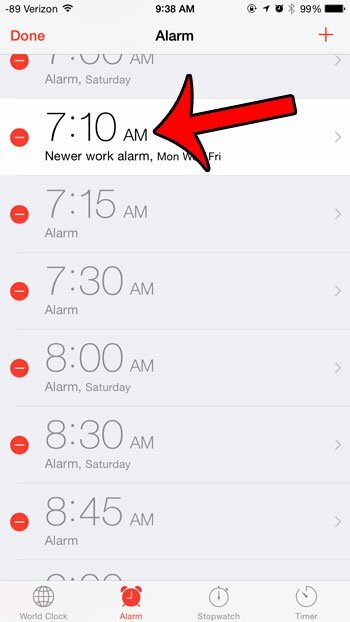 Tap the Save button at the top-right corner of the screen to create the alarm. Step 2: Tap the Edit button at the top-left corner of the screen. 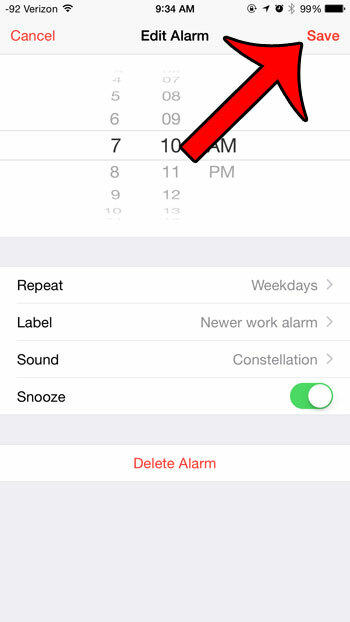 Step 3: Select the alarm for which you want to change the time. Note that active alarms are highlighted in white. Step 4: Use the wheels at the top of the screen to adjust the time, then touch the Save button at the top-right corner of the screen. 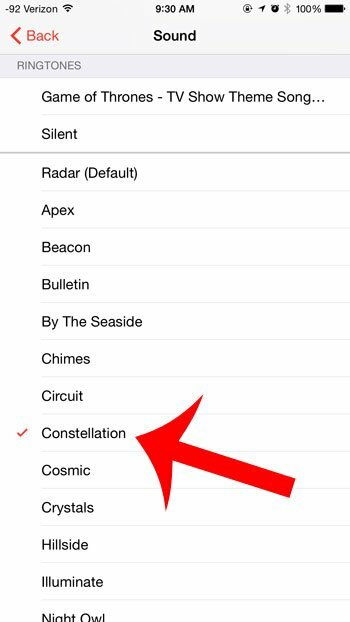 Step 3: Select the alarm for which you want to change the sound. Active alarms have a white background. Step 4: Touch the Sound button. 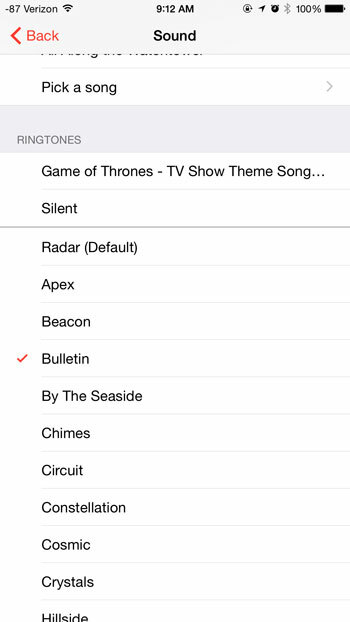 Step 5: Select the new sound, then tap the Back button at the top-left corner of the screen. Step 6: Touch the Save button at the top-right corner of the screen to save the alarm. Step 3: Select the alarm whose name you want to change. Step 4: Touch the Label button. 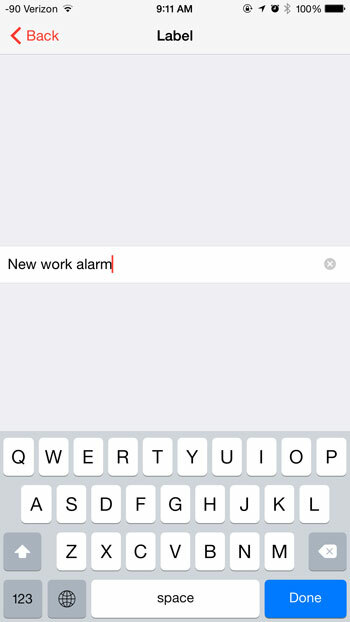 Step 5: Tap the x button to delete the existing alarm name, then enter the new one. 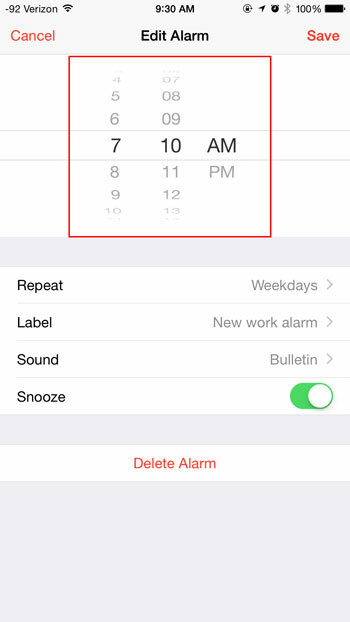 Touch the Back button to return to the alarm menu. Step 6: Touch the Save button at the top-right corner of the screen. Step 2: Touch the Edit button at the top-left corner of the screen. Step 3: Select the alarm that you want to change. Step 4: Touch the Repeat button. Step 5: Tap days with red check marks to remove the check mark, then tap days without check marks to add them until each day that you want the alarm to go off has a red check mark next to it. Touch the Back button to return to the menu. Step 6: Touch the Save button to save the alarm. 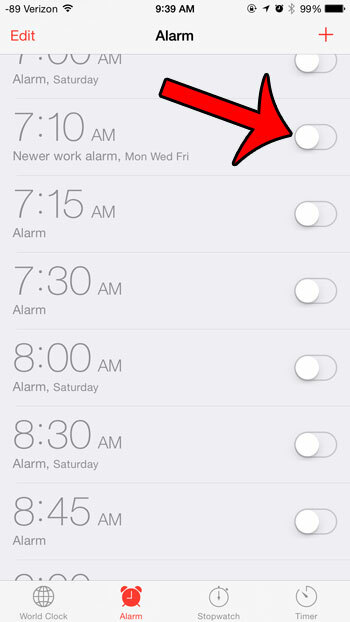 Step 3: Select the alarm for which you want to change the snooze setting. 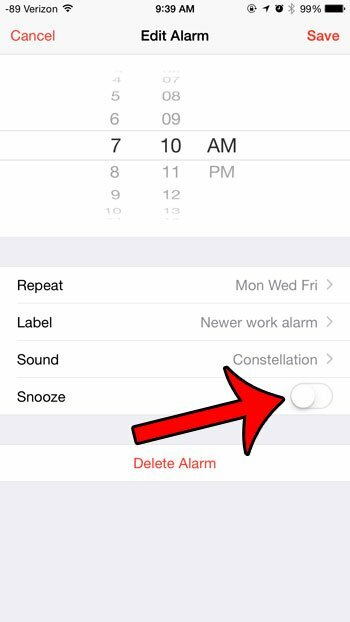 Step 4: Tap the button to the right of the word Snooze to adjust the setting. 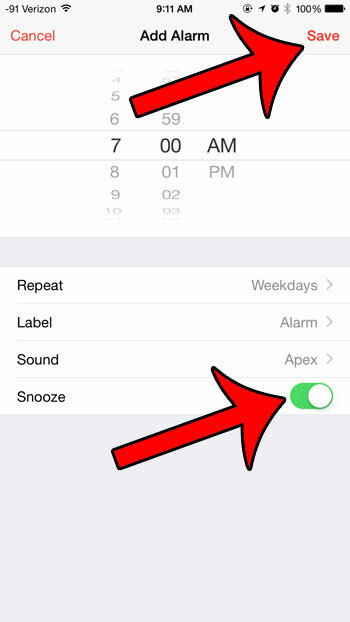 If there is green shading around the button, then snooze is turned on. If there is no green shading, then snooze is turned off. 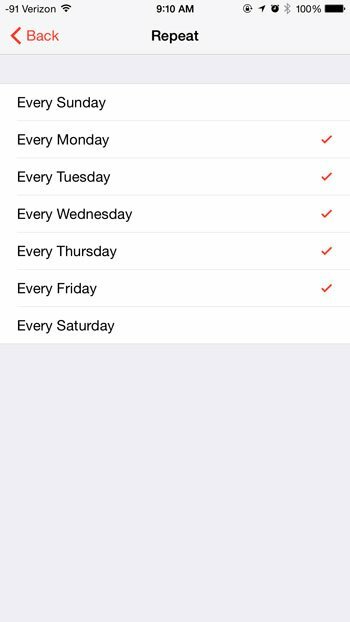 Tap the Save button at the top-right corner of the screen to save your settings. Step 2: Tap the button to the right of the alarm that you want to turn off. If there is no green shading around the button, as in the image below, then the alarm is turned off. Step 2: Touch the red Edit button at the top-left corner of the screen. 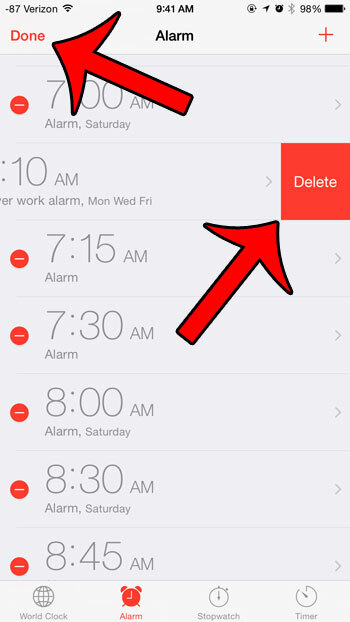 Step 3: Touch the red circle to the left of the alarm that you want to delete. Step 4: Touch the red Delete button to remove the alarm, then touch the Done button at the top-left corner of the screen. Note that there doesn’t seem to be any defined limit to the number of alarms that you can set on your device. The only limit that you might encounter would be the amount of storage space on your iPhone, but alarms take up a minimal amount of space, so you could literally have thousands of alarms on your iPhone before it became an issue. Scrolling through, editing and deleting them would be pretty difficult, however. Did you know that you can have a private browsing session on your iPhone? Learn about private browsing and see how it works on your device’s Safari browser.